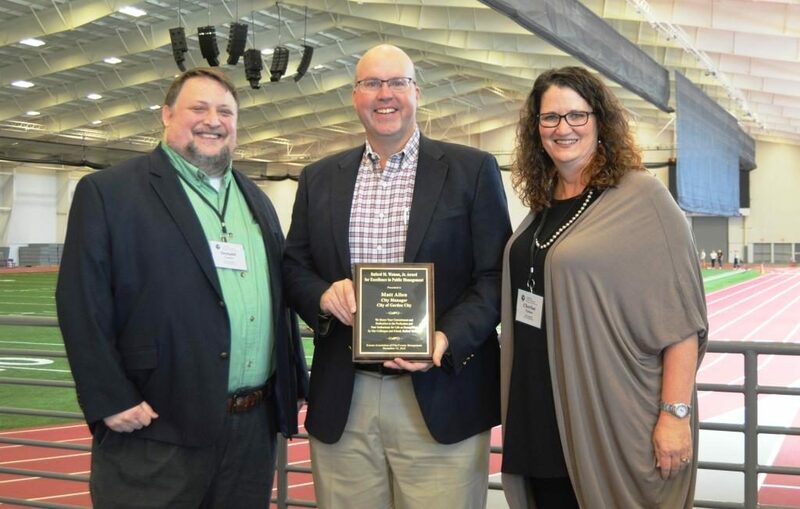 KACM President Don Cawby, left, and KACM Vice President Cherise Tieben present Garden City Manager Matt Allen, middle, with the Buford Watson Jr. Award for Excellence in Public Management award, the most prestigious award a city manager in Kansas can receive. 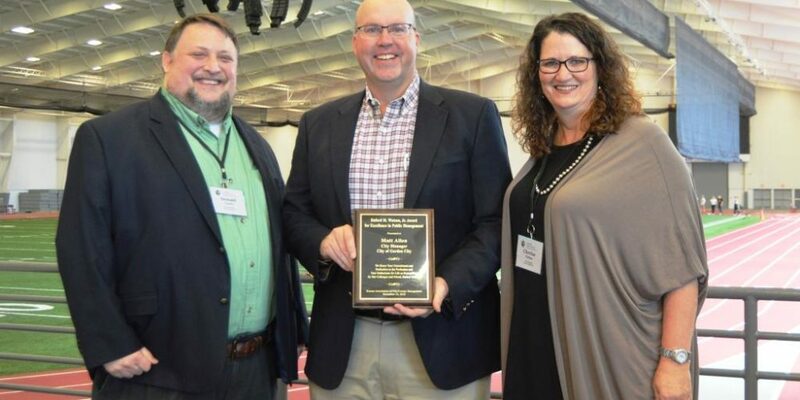 GARDEN CITY — City Manager Matt Allen was named the recipient of the Buford Watson Jr. Award for Excellence in Public Management by the Kansas Association of City/County Management (KACM) during the association’s annual conference held in Pittsburg on November 14-16. Allen has been the City Manager of Garden City since 2008, first serving as the Assistant City Manager for six years. Allen’s municipal government team has received state and national recognition for innovation in areas of public participation, local government social media, fiscal transparency, embracing diversity and healthy community design for rural communities. John Deardoff, City Manager of Hutchinson, nominated Allen for the award. “Matt has been a strong voice for southwest Kansas through his work on major regional transportation issues involving Essential Air Service, Amtrak and highways,” Deardoff wrote in his nomination letter. Allen was raised in Garden City and holds a Bachelor of Arts Degree from Bethany College as well as a Master of Public Administration from the University of Kansas. His first career opportunity in city management was as a part-time intern with Saline County in 1994. Allen has also worked for the Lenexa, Salina, Joplin, Mo., and Oakley before settling back in Garden City.